Makeshift Heavy-Duty 64x36x100 Wire Spool Holder/Storage/Rack w/ Swivel Casters. Comes in non original packaging. The wire holder is in good cosmetic condition with some light wear from previous use. 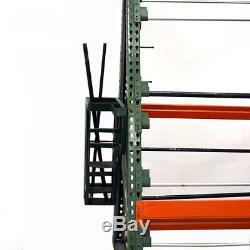 The frame is made from pallet rack shelving. 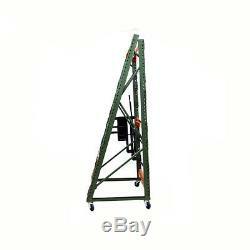 The uprights and the beams were fabricated into this wire spool rack which is very sturdy and durable. There is a bin for storage etc. On one side of rack (see pictures). The swivel casters make for smooth rolling and turning in all directions with no issues. The pole holders are interchangeable to different heights. No manuals, cords/cables, or additional items are included if not listed or shown. (1) Makeshift Heavy-Duty Wire Holder/Rack/Storage w/ Swivel Casters. # of Poles: 5 steel, 4 aluminum. Caster Size: 5" x 1". For questions regarding this item, please reference the SKU to help us better serve you. DougDeals is an ISO 14001 and OHSAS 18001 registered company. DougDeals directly accepts US and Canadian issued credit cards only. Please fill out this form. This item is guaranteed to be as described. DougDeals reserves the right to refuse service to anyone that does not comply with the terms listed and linked here. The sole and exclusive venue for any lawsuit arising out of or relating to this agreement shall be the Travis County Civil Courts of Travis County, Texas. 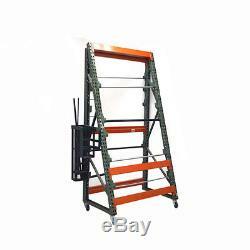 The item "Makeshift Heavy-Duty 64x36x100 Wire Spool Holder/Storage/Rack with Swivel Casters" is in sale since Wednesday, April 06, 2016. 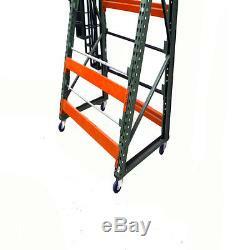 This item is in the category "Business & Industrial\MRO & Industrial Supply\Material Handling\Shelving & Storage\Other MRO Shelving & Storage".